The ultra-freeze plus is a revolutionary product that will render the use of dry ice in the transport of biological and other samples redundant. 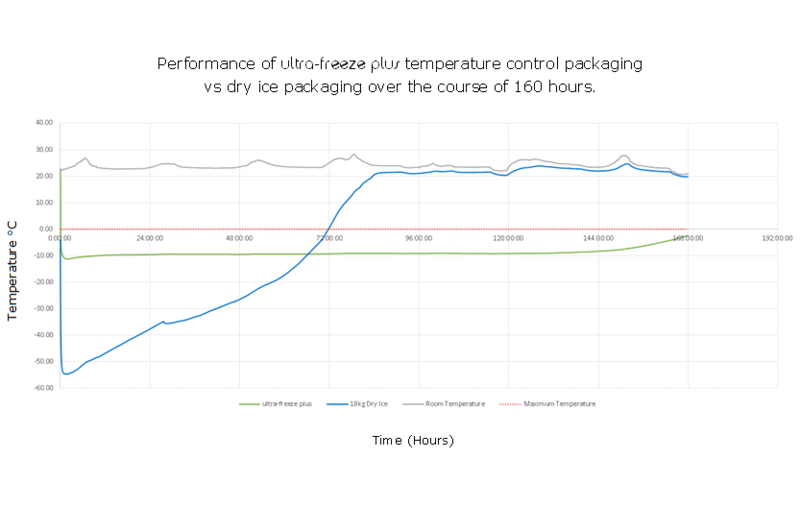 Through the use of patent pending phase change technology the ultra-freeze plus will maintain a temperature range below 0°C for 168+ hours. The ultra-freeze plus performance has been thoroughly tested and verified by independent laboratories. It is suitable for the transport of non-hazardous materials, biological substances, infectious substances and has a capacity of 3.0 Litres. Please view product gallery for performance graph. Tested and certified for Packing Instructions 620 and 650 under the IATA Dangerous Goods Regulations. A must have product to ensure your valuable shipments are compliant to the IATA Dangerous Goods Regulations.